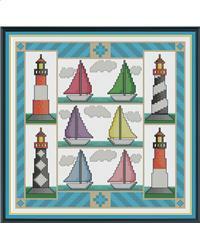 Sail away into the sunlight on six pretty little boats guided by four gorgeous lighthouses! This bright pattern is bold and full of colour and is a joy to stitch. I recommend stitching this on light blue fabric, so that you get the appearance of a blue sky. Project Size: 9" x 9"